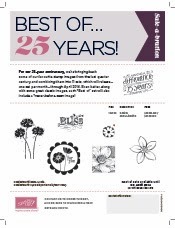 Best of 25 years stamp collections. 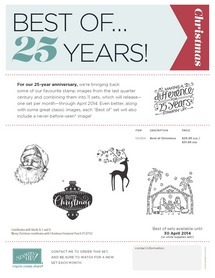 As part of Stampin' Up!s 25-year anniversary celebration, we're bringing back some of our favourite stamp images from the last quarter century and combining them into five sets, which will be released -one set per month- until April 2014. Even better, along with some great classic images, each "Best of" set will also include a never-before-seen image! 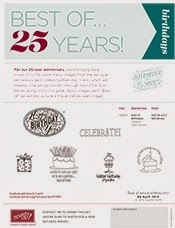 This month - it's Best of Sale-a-Bration! To order, head on over to my online shop or contact me by phone 0417 165 345 or email.